I hope everyone had a great Thanksgiving last week! I didn't plan a menu last week and really regretted it a few days, I hadn't realized how much I have come to rely on my menu planning. It's going to be a fairly simple week as far as cooking goes this week, I have a few items in my freezer I need to use up and I haven't been feeling very well so I just don't really feel like doing a bunch of cooking. Here's what I have lined up for us this week: Monday - Stuffed Pork Chops, My Grandmothers Green Beans, Sweet Dinner Rolls Tuesday - Italian Skillet Supper Recipe, Bread Machine French Bread Wednesday - Shrimp and Vegetable Stir-Fry, White Rice Thursday - Chicken Fried Pork Chops, Mashed Potatoes, Corn, Cornbread Friday - Anna's Amazing Easy Pleasy Meatballs over Buttered Noodles (This recipe as written is for 24 servings so use the calculate button to adjust the recipe to fit your needs) For more Menu Plan Monday ideas be sure to visit I'm an Organizing Junkie. I hope everyone else had a wonderful Thanksgiving! Here are some pictures from our day yesterday! I managed to snag these glasses and plates at our local grocery store on sale for 90 percent off. I paid only twelve cents a piece for them and I think they look beautiful. I made the napkins. This is Bartholomew, our pilgrim that we found at Cracker Barrel. Our turkey that my husband deep fried. It tasted great. Our Pumpkin Cake - of course I forgot to take a picture of it BEFORE I cut it so here is a picture of the back side. It looked much better before we cut it. Our German Chocolate Cake which was so moist it split in the middle. What is Thanksgiving without a few hiccups? I don't know about you but I absolutely love Tip Nut. If you haven't taken the time to visit their website you really should, it's always full of really neat and useful information. I visit their website alot, so you can just imagine my suprise when I found my very own Bread Machine French Bread recipe listed in Tip Nut's recent post "22 Bread Machine Recipes: Breads, Rolls & More". Thank you Tip Nut! I have been meaning to post this for a while but time just got away from me this year. This year we decided to make sure and give Thanksgiving the honor it deserves in our home as a holiday. We started out by counting down the days to Thanksgiving. I made this little pockets out of felt to help us count down the days. I then hung them from ribbons using clothespins starting twenty days before Christmas. The pockets are sewn rough, they are meant to look like that I wanted to give them the rustic look. In each pocket I placed seven leaves. One leaf had a bible verse for the day written on it and the other six leaves were left blank. Each night after supper we would read the bible verse, and then each one of us would write what we were thankful for on our leaf. Once we wrote what we were thankful for on our leaf we would hang it on our Blessing Tree. This is what our tree looked like at the beginning of the month, now the tree is completely covered. My grandmother will be bringing Chocolate Pie, Blueberry Pie and Dutch Apple Pie. What's on your menu for the big day? You may have noticed that I haven't posted a lot over the past few weeks, it's a crazy time of year for me (as it is for most people) and I just haven't found the time to blog. I didn't even post a menu plan for this week because we are going without one (GASP!). On Monday night my husband fixed Bacon, Egg and Cheese Sandwiches for us all, and last night we ordered pizza. We have chili cooking in the crockpot for supper tonight, I like to take it easy right before a big holiday. We will be having fifteen people over for lunch tommorow with the possibility of another four stopping by in the afternoon. 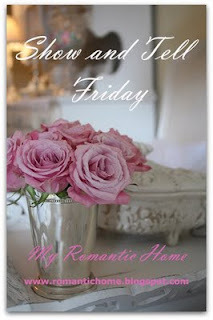 I will be spending the day today cleaning the house, cooking, and getting ready for tommorow. I love holidays but boy are they work! Last week was a busy week for us. We tried several new recipes, and for the most part they went well. We absolutely loved the Foil Pack Chicken Fajita Dinner. It was a great meal, but I didn't realize how much the rice would swell up and I used way too much rice. We had to run to town Saturday morning to take care of some paperwork so I didn't get to make Dad's Pancakes or the White Sauce. This week is set up to be another very busy week. I have several new recipes planned, and on Saturday we are having my in-laws up to celebrate my father-in-laws birthday. Plus there is all the pre-Thanksgiving work that needs to be done. Jody at Living on 4th Street is hosting her very first giveaway, and in the spirit of Thanksgiving is giving away a handsewn "Give Thanks" banner. You only have until Wednesday morning to sign up so be sure to head on over there, and even if you don't want to sign up for the giveaway you should definetly check out her blog, she always has the most interesting posts on there, as well as some delicious recipes! Am I the only one who likes to shop for the holidays AFTER the holidays are over? I love shopping the after holiday sales and getting holiday items for as much as 90 percent off. Our local grocery store has had these guys in their holiday aisle for quite a while now, and I noticed them everytime I went by but they wanted $24.99 a piece for them before Halloween. Outside my window....yesterday's sunny skies are gone, now it's gray and overcast. I am thinking....I can't believe Thanksgiving is almost here! I am thankful for.....the little things in life, like chocolate. I am remembering....how much fun the kids had climbing the trees Saturday night when we were enjoying the unusually warm weather and cooking out. I am going....shopping tommorow to try to find long sleeve red shirts for the girls to wear to school Wednesday for Veterans Day. It's proved harder to find a nice long sleeve red shirt than I thought it would be. I am reading....still nothing! Promise you won't tell on me! I am hoping....that this migraine goes away soon. Pondering these words...."Count your blessings, name them one by one. Count your blessings, see what God hath done." From the song Count Your Blessings written by Johnson Oatman, Jr.
Last week was another busy week, and our menu didn't go exactly as planned. While for the most part we did stick to our menu the Smoked Sausage Potatoes, Peppers & Onions as well as the Vegetable Soup with Hamburger got dropped from the menu. Although our Homemade Chicken Noodle Soup did find it's way onto the menu. I am hoping that I can stick to this week's menu a little better! Although I am wondering if I am doing the right thing this week since we are trying four new recipes this week, five new recipes if you count the White Sauce for Saturday's breakfast. I have said before I was going to keep it to two new recipes a week but there are just so many recipes on my list of things I want to try! I will let you know next week what I thought about all of the new recipes this week. I know it's been almost a week since Halloween, and I promise this will be my very last Halloween post for this year, but I just couldn't resist sharing the really cute Halloween bags I made this year. Unfortunately I procrastinated this year and by the time I got to the store the majority of the Halloween fabric was already gone so I didn't have a lot to choose from. These are the bags I made for the boys, the inside of the bag is lined with solid black. And these are the bags I made for the girls. These were my favorite, they are lined with hot pink satin, and they received so many compliments on them. I wish the boys bags had turned out this good! What's worse than having all four of my kids sick at the same time? Don't get me wrong, I love him to death but when he is sick he is the biggest baby in the world. Well, in case you haven't guessed it yet, he's sick. He has a cold and a sore throat, and last night he wanted soup for supper. So we moved around our menu for the week and had homemade chicken noodle soup. Mix all ingredients except the egg noodles into a stock pan. Bring to a boil and then reduce to medium-low heat to simmer. I like to allow the soup to simmer for about an hour, but it is not necessary, I didn't last night. About ten minutes before you are ready to serve add in the bag of egg noodles. For this week's Wordless Wednesday I thought I would share some pictures from this past weekend's camping trip. This is one of my favorite crockpot recipes, and it is one that I cooked just this weekend at the campground. It is easy to make, and can be used as a main dish in a pinch. Cut up the block of Velveeta Cheese into cubes, and put into the crockpot. Add in the jar of salsa and ground beef, stir to mix ingredients together. Cook on low for two to four hours, the main idea is to just melt the cheese. If needed you can stir the cheese to keep it from burning. Serve with tortilla chips. 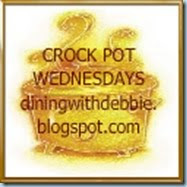 For more crock pot recipes visit Dining With Debbie. In a small bowl beat two eggs, in a second bowl combine the herbs, and place the bread crumbs in a third bowl. Dip each pork chop in the egg and shake off any excess, rub the pork chop with the herb mixture, and dip back into the egg mixture. Shake off excess egg and roll in the bread crumbs. In a large skillet heat the 2 tablespoons canola oil. Cook pork chops until golden brown on each side, five to six minutes total, turning once. It's been a long, long week for me, and I am absolutely exhausted! We had a great time on our camping trip but now I have all the post-camping mess to deal with. Sheets to wash, clothes to get the mud out of, you know all the fun stuff. After last weeks crazy week, it's nice to be able to get back to a normal schedule. Friday - Pizza Braid Sunday - Eat out after church and leftovers for supper I am not planning anything for Saturday night because we may take the kids to the museum that day. 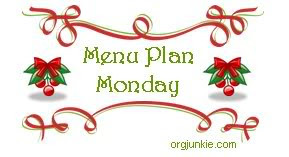 For more Menu Plan Monday ideas please visit I'm an Organizing Junkie.